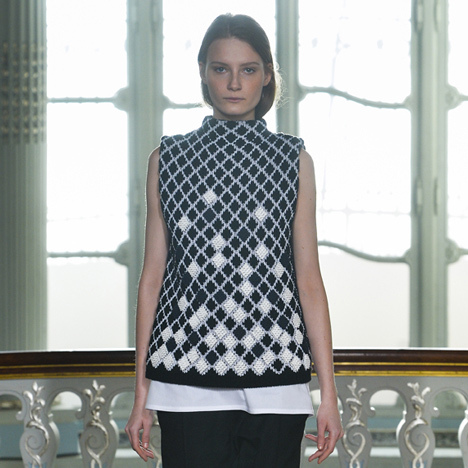 Fashion brand Pringle of Scotland has incorporated laser-sintered nylon fabric into garments for its Autumn Winter 2014 collection, shown yesterday at London Fashion Week. Pringle of Scotland collaborated with material scientist Richard Beckett to create a series of 3D-printed fabrics for the collection using selective laser sintering (SLS). To produce textiles that could move like traditional cloths, Beckett chose specific machinery that could create the tiny nylon parts needed to keep the material flexible. "I used an EOS Formiga P100 SLS system due to its ability to build at high definition, one of the few systems that would allow you to build such complex movable parts at this size," Beckett told Dezeen. The printed sections were then handwoven into the knitwear through small hooks on the underside or stitched on top of the wool. Bands of the material formed cuffs for jackets while larger elements created diamond-shaped Argyle patterns across pullovers and sleeveless tops. 3D-printed garments have previously appeared in Haute Couture fashion collections by designers such as Iris van Herpen and a bespoke garment for Dita Von Teese, but Pringle of Scotland claims that this is the first time the technology has been used for ready to wear. "I wanted to explore a move away from the more sculptural costume approach of such pieces, towards a more material, haptic-based approach," said Pringle of Scotland head of design Massimo Nicosia. The Autumm Winter 2014 collection was presented during this season's London Fashion Week, which concludes tomorrow.